Thinking about getting another .45 auto. I took my Kimber Micro 9 completely apart trying to get rid of that frigging series 80 safety. Now now its in a bowl with me trying to figure out how to well you know put the mother frigging thing back together. It really likes to eat the Speer gold dots. Gunsmith at the nice Florida Gun Exchange fun shop had that sear back in in under 10 minutes. It went completely vertical and that is the only way I did not think to try. Nothing like a great gunsmith that can go from weapon to weapon and fix the dang things. I tipped him well. I have followed this thread with great interest. Before I knew better I went through all kinds of handguns and many calibers. I sold all of those and for the last 55 years I've only owned and shot 1911s with the exception of the model 29 in .44 mag. I carry two series 70 1911s. My friend, Jim Clark fitted one of them with the .460 Roland. My .460 shoots the standard .45 ACP and the Roland additionally shoots the .460, its case 1/16 inch longer than the .45. The 1911, in addition to being very accurate, with a powerful punch and reliable is also easily concealed. 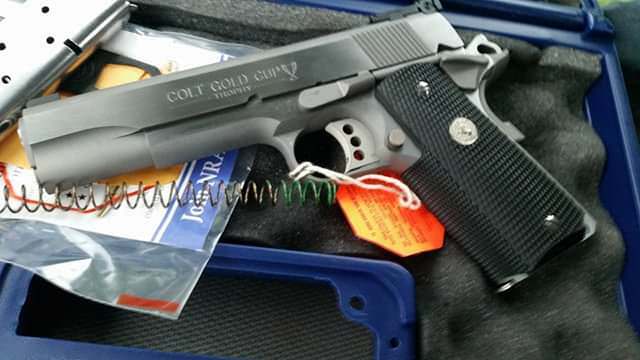 The best handgun ever made is Colt's Gold Cup National Match Series 70 1911. Nothing to pistol shooting, just don't flinch, ever. Challenge Doc in the Arcade! Pull the series 80 thingy out and replace with with a piece of plastic..
Bad joke aside there is a plate made as a filler.